Ideal for use in harsh weather & high wind conditions. Duck Covers soteria series patio furniture covers are designed to protect patio furniture from dust, dirt, sun, rain & heavy snow. Manufactured using a durable fabric with a water-resistant backing features a sporty webbed accent. Tape sealing at critical seams prevents leaking & Double-stitched seams provide extra durability. Grey color. Two-year limited warranty has you covered. 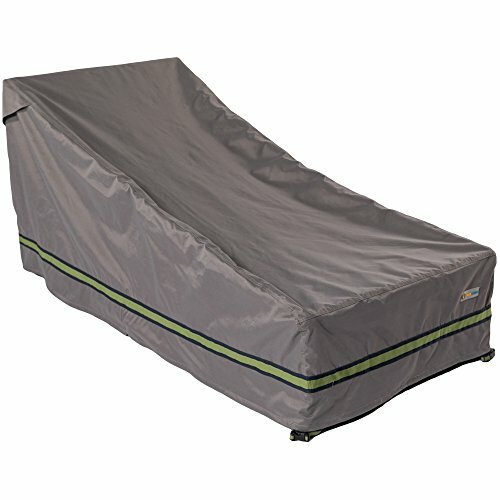 Migrate to Duck Covers today! PATIO CHAISE LOUNGE COVER COVERS: Duck Covers Soteria Rainproof Outdoor Patio Chaise Lounge Chair Cover is designed to fit patio chaise lounge chairs 86"W x 36"D x 32"H.
PATIO CHAISE CHAIR COVER WITH WARRANTY: This Duck Covers Soteria Rainproof Patio Chaise Lounge Cover comes with a two-year limited warranty. SUPERIOR PROTECTION AND STYLE FOR YOUR OUTDOOR PATIO LOUNGE CHAIR: This Duck Covers Soteria outdoor patio chaise lounge chair cover is made with durable fabric and a water-resistant backing. The patio lounge chair cover also features a sporty webbed accent for a stylish touch. SEMI-CUSTOM PATIO CHAISE LOUNGE CHAIR COVER: This patio chaise lounge chair cover features click-close straps in each corner hold the cover securely in place. This chaise cover also features an elastic hem with cord locks provide a custom-like fit. DURABLE OUTDOOR LOUNGE CHAIR COVER: Air vents reduce condensation and wind lofting. Tape sealing at critical seams prevents leaking. Double-stitched seams are added for extra durability. Chaise lounge chair cover is not designed to entirely cover the wheels or legs.